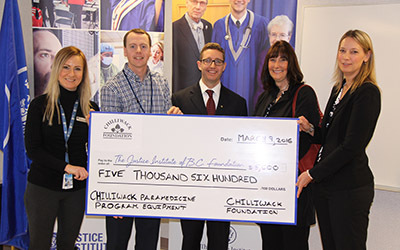 Paramedic students at the Chilliwack Campus of the Justice Institute of British Columbia (JIBC) will benefit from a generous $5,600 donation from the Chilliwack Foundation. The grant from the community foundation will be used to purchase new training simulation equipment, including two new adult intubation heads, a portable vital sign machine and an IV training arm. The portable vital sign monitor is the first unit of its kind purchased for paramedic education in the Health Sciences Division. Paramedic students training at the JIBC Chilliwack Campus will be able to practice using this equipment during simulation training prior to using during their practice education placement shifts. Over the years, JIBC has continued to deepen its roots in Chilliwack since opening a campus in the city in 2003 to specifically serve the Fraser Valley region. 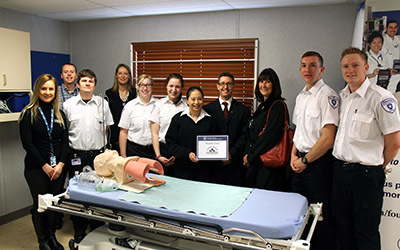 The Chilliwack Campus, which is located within Canada Education Park, houses a fully equipped learning lab and on-site training ambulances. The Chilliwack Foundation has a proud history of community support that spans over 20 years, remaining a pillar of community service and leadership in the Chilliwack area since it was established in 1985. The Foundation raises funds for important causes, community needs, and initiatives that benefit service and charitable organizations in Chilliwack. Since 1993, The Justice Institute of British Columbia Foundation (The JIBC Foundation) has worked on behalf of JIBC to raise funds for scholarships and bursaries, applied research, equipment and other tools that impact student success. The Foundation is the recipient and steward of charitable donations and builds meaningful relationships with communities to support Canada’s leading public safety educator.